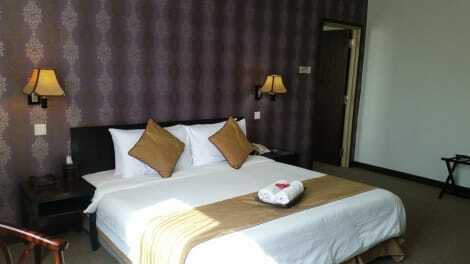 Biz Hotel Shah Alam is located in Shah Alam, 6 km away from Shah Alam Convention Centre. Rooms are well-appointed and fully air-conditioned. Free WiFi is provided throughout the hotel. This modern building is situated 7 km away from Shah Alam Stadium as well as the State Monument and State Secretariat Building. Kuala Lumpur International Airport is 35 km from the hotel. Each room is furnished with a writing table, a work desk and a flat-screen TV. They also have an en suite bathroom featuring free toiletries and hot-water showers. Biz Hotel Shah Alam houses a 24-hour front desk. Parking facilities are available at an additional charge. For guests' convenience, a water dispenser is available on every level. Ironing facilities and a hairdryer can be provided upon request. Satisfy your appetite for lunch or dinner at Carlton Gourmet, a restaurant which specializes in Halal dishes, or stay in and take advantage of the room service (during limited hours). Buffet breakfasts are available daily from 7 AM to 10 AM for a fee. Make yourself at home in one of the 86 air-conditioned rooms featuring LCD televisions. Cable television is provided for your entertainment. Conveniences include coffee/tea makers and complimentary bottled water. With a stay at Grand Bluewave Hotel Shah Alam in Shah Alam, you'll be within a 10-minute drive of i-City and Shah Alam Stadium. This 4.5-star hotel is 8.5 mi (13.7 km) from Sunway Pyramid Mall and 5.7 mi (9.2 km) from Empire Shopping Gallery. Make yourself at home in one of the 58 air-conditioned rooms featuring LCD televisions. Complimentary wireless Internet access keeps you connected, and satellite programming is available for your entertainment. Private bathrooms with showers feature rainfall showerheads and hair dryers. Conveniences include phones, as well as desks and coffee/tea makers. This hotel was built in 2015. Located in Shah Alam, New Wave Shah Alam Hotel is within a 15-minute drive of i-City and Shah Alam Stadium. 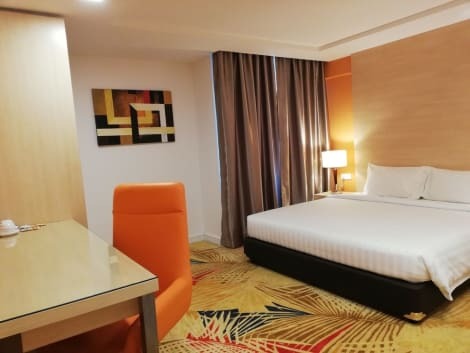 This hotel is 6 mi (9.7 km) from Sunway Pyramid Mall and 10 mi (16.1 km) from University of Malaya. Located in Shah Alam, OYO 258 Hotel SMC Alam Avenue is within a 15-minute drive of i-City and Shah Alam Stadium. This hotel is 10.6 mi (17.1 km) from Sunway Pyramid Mall and 4.7 mi (7.6 km) from Klang Parade. With a stay at Alami Garden Apartment & Homestay in Shah Alam (Seksyen 13), you'll be within a 15-minute drive of i-City and Shah Alam Stadium. This hotel is 7.6 mi (12.2 km) from Sunway Pyramid Mall and 11.6 mi (18.6 km) from University of Malaya. 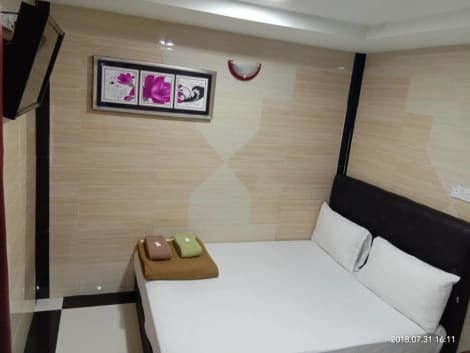 lastminute.com has a fantastic range of hotels in Shah Alam, with everything from cheap hotels to luxurious five star accommodation available. We like to live up to our last minute name so remember you can book any one of our excellent Shah Alam hotels up until midnight and stay the same night.